1-54 FORUM, the fair’s annual talks program, is curated by Koyo Kouoh, Founder and Artistic Director of RAW Material Company, Dakar and supported by Gabriella Beckhurst (FORUM Curatorial Assistant). For us, to be unsettled by the very word “community” is to remind ourselves that the word “community” might not name all it is that we can do and can be when we “get together.” If we can return in conclusion to the idea of community as “common ground” rather than commonality, we might think of communities as effects of how we meet on the ground, as a ground that is material, but also virtual, real and imaginary. Sara Ahmed and Anne-Marie Fortier, “Re-imagining communities,” in International Journal for Cultural Studies, Vol 6(3), 2003, 251-9. This year’s FORUM program in New York City convenes a range of artistic practices and aesthetic sensibilities around the idea of community. Sara Ahmed and Anne-Marie Fortier’s notion of community – not as a foundation but as a process of commoning and as a site activated by relations – finds voice and is expanded here. Bringing together an incredible set of artists, performers, curators, and scholars, FORUM will unfold a spectrum of aesthetic strategies that deal with temporal and material abstraction, narrativization, and transformation, using resistance, defiance, pleasure, and desire as some of their guiding principles. The program will examine how such strategies take shape and how a language capable of fighting back against a matrix of oppression can develop out of them; a language which rekindles the dignity and compassion of those who advocated and resisted before us; one capable of articulating a diverse set of voices and celebrating the differences between them. As systems of oppression and control contact our lives in more pervasive and affecting ways, militating against them remains critical: from addressing the new challenges presented by a volatile political climate to, as Raél Jero Salley puts it, “still-active legacies.” As artist methodologies filter into and blur academic disciplines, activist and social practices, we look to the radical traditions of artmaking in search of strategies for political liberation. Contemporary artists and theorists continue to explore ways of engaging or “commoning” with the past. Artistic engagements with historical conditions – be they artistic, familial, civil rights, critical race, feminist, or queer – can offer us generative methods with which to build intergenerational communities across pasts, presents, and futures. But what is at stake in this restaging of community, and how does history collide, re-presence, or open up possibilities in our presents? With antagonism the automatic response, how do the arts – which often bear the weight of responsibility in unfolding and imaging new worlds – remind us that following the force of refusal comes organisation, regrouping, and the building of coalitions? Opening the program, Raél Jero Salley invites us to consider the ways in which artistry enables us to visualize, but also mobilize such transformative socio-political communities. His lecture will probe the question: how do we occupy these social frameworks as a “we,” and what is implied in acts of re-drawing collectivization? Ultimately, Ahmed and Fortier remind us that community can be remade – not only in a material sense, but virtually and speculatively; as we move between virtual and physical realities our diverse nets of community reach further, as well as tangle. As spaces online demonstrate most clearly, communities aren’t always brokered through affinities or likeness. Nor do they, as Ahmed and Fortier suggest, prescribe a requisite of connection. Community can even be based on refusal: it can be noisy, dissonant, polyphonic, fugitive, opaque. These are the communities that I’m interested in exploring with you. For FORUM’s opening address, Salley discusses how “Looking After Freedom” is a way of making “we, the people.” “Looking After Freedom” means caring enough to invent more humanly workable visual, material, and conceptual resources. Artworks provoke new forms for and of imagination. Here, Salley’s point of return is that artists (makers) are always already doing this nurturing work, and invite their viewers to join in. Creative works can mediate fundamental paradoxes that were built into contemporary politics after, during and through struggles for liberation. The struggles are not “post” – citizens find themselves struggling through present-colonialism, present-apartheid, and present attacks on civil rights. “Looking After Freedom” is, therefore, a shorthand for dynamic creativity that goes beyond reflecting situations of injustice, inequality, oppression, violence and the like – from merely documenting them or responding to them – toward generative tools and methods for transformation. Artists Mendi + Keith Obadike discuss the ways their art deploys technology, narrative structure, and sound in space. Sharing details about past and upcoming projects, they delve into the significance of aural expansion, textual assemblage, and unexpected juxtapositions in their intermedia work. Sondra Perry, the subject of the solo exhibition Resident Evil at The Kitchen (2016) and Thomas J. Lax (Associate Curator, Museum of Modern Art) discuss legacies of media art, the role of appropriation, and the stakes of representing violence and social protest. Tavares Strachan’s You belong Here (2011), a 120ft x 27ft neon piece, was displayed on a barge on the Mississippi River during Prospect.3, the New Orleans biennale, in 2014. With the work, the Bahamian-born artist boldly affirms his presence, his right to belong, to be firmly emplaced, and to be part of an American consciousness. Yet as he also explained, “to belong” is polemical and complex when considered against the history of race and immigration in the United States. In this current political climate of resurgent nativism and nationalism in the United States and around the world, how might we consider the values of Black art and aesthetics as a strategy of engagement? In this conversation with Ugochukwu-Smooth C. Nzewi (Curator of African Art, Hood Museum of Art, Dartmouth College), artists Odili Odita and Sadie Barnette respond to the assault on “otherness,” drawing upon their creative practice, backgrounds, and individual experiences. In a discussion moderated by Eungie Joo (Artistic Director, 5th Anyang Public Art Project–APAP 5), artist Charles Gaines, his son, Malik Gaines and son-in-law, Alexandro Segade (2/3 of the collective My Barbarian) continue their 25-year discussion of the shifting terms of a shared political imaginary, considered through their artistic and academic practices. This conversation touches on how their very different practices speak to each other across generations of influence, appropriation, rejection, and transformation. In a panel chaired by Nicola Vassell (Founder, Concept NV), artists Derrick Adams, Marcia Kure, and Tschabalala Self discuss strategies of collage and new media abstraction – both online and offline – in visualizing and celebrating blackness. Looking to their respective practices, the dialogue will consider how revisiting modernist and conceptual traditions of collage and dis/assembly make possible new aesthetic forms in an era of viral imaging. 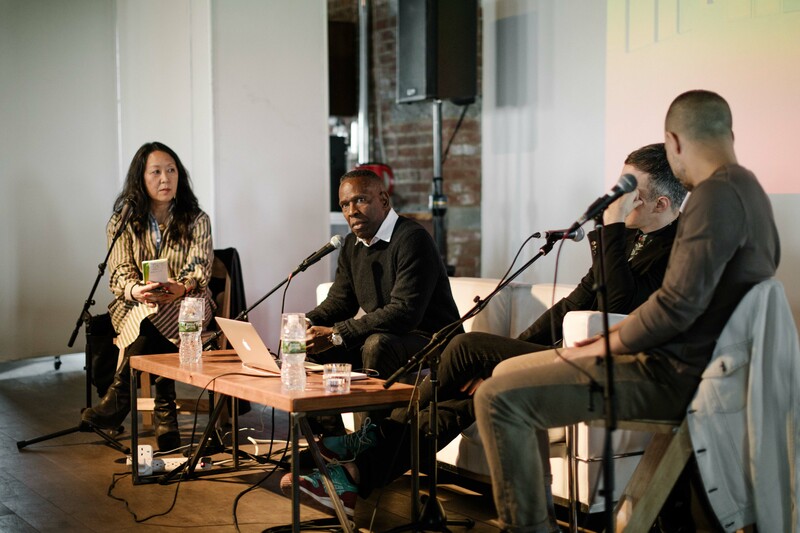 Focusing on Adam Pendleton’s art of the past two years, from his installation for the Belgian Pavilion at the 2015 Venice Biennale to his recent suite of paintings entitled Untitled (A Victim of American Democracy), Pendleton and curator Adrienne Edwards explore abstraction as a platform for revolutionary possibilities in art and politics. ‘découpé’: A concert by Robert Aiki Aubrey Lowe © Katrina Sorrentino. 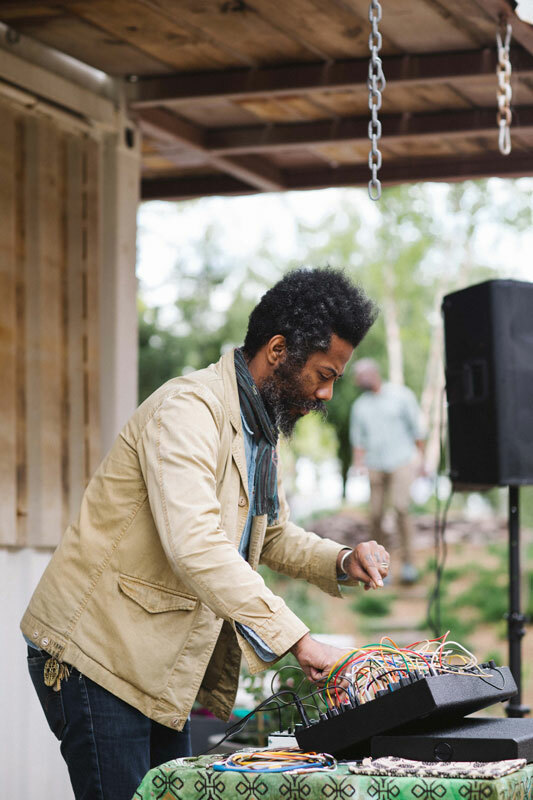 Robert Aiki Aubrey Lowe (b. 1975) is an artist and composer that works with voice in the realm of spontaneous music. Most recently, creating work with modular synthesizer for both sound and video, has been a focus of his live performance and installations. The marriage of synthesis and the voice has allowed for a heightened physicality in the way of ecstatic music, both in a live setting and recorded. The sensitivity of analogue modular synthesis echoes the organic nature of vocal expression which in this case is meant to put forth a trancelike state. Lowe’s works on paper tend towards human relations to the natural/magical world and the repetition of motifs. Through collaboration Lowe has worked with Ben Russell, Ben Rivers, Sabrina Ratté, Rose Lazar, Nicolas Becker, Jóhann Jóhannsson, Tarek Atoui, Philippe Parreno, Evan Calder Williams, Ariel Kalma, Lucky Dragons, Alexandra Wolkowicz, Biba Bell, ADULT., Doug Aitken and Rose Kallal, among others.